The most common Neo-Pagan ritual form involves the “casting” of a circle, the “calling” the four elemental quarters corresponding to the cardinal directions, and invoking the Goddess and the God. The effect can be visualized as a quartered circle, a cross circumscribed by a circle, drawn on the ground. The purpose is to connect the participants to the physical space and sacralize it. 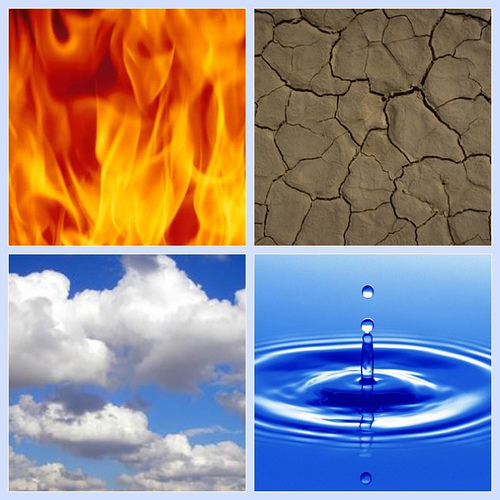 In Neo-Pagan practice, each of the “quarters” or cardinal directions corresponds to one of the four classical “elements” described by Plato and Empedocles: air, fire, water, and earth. The most common associations are East-Air, South-Fire, West-Water, and North-Earth. The four quarters may also correspond to the four seasons, East-Spring, South-Summer, West-Autumn, and North-Winter. However, these associations may vary depending on geographic circumstances and symbolic preferences of the practitioners. For example, Neo-Pagans on the East Coast of the United States may associate water with the east. Neo-Pagans in the southern hemisphere commonly reverse the latitudinal associations of practitioners in the northern hemisphere. Similarly Neo-Pagans in the Bay Area in California may make different associations than Neo-Pagans in the Great Lakes region, due to the different seasonal cycles of the areas. These associations resemble Carl Jung‘s four “functions”: thinking, intuition, feeling and sensation. Each of the elements has other associations, including certain colors, altar tools (sword/knife, wand/candle, chalice/water, paten/salt), and Tarot suits (swords, wands, cups, pentacles). The quarters are also sometimes associated with four aspects of the Moon Goddess and stages of human life. The purpose of these associations is to connect our inner experience with our perception of the outer world. The center of the circle, where the four directions intersect is considered a special place. Some Neo-Pagans associate the center with a fifth element, a quintessence or Spirit. Some Neo-Pagans also add a vertical dimension by invoking the directions up and down in the center of the circle. This creates an axis mundi which connects sky and underground. This may be visualized as a tree with its branches reaching into the sky and its roots reaching underground. The vertical directions may have other associations, like spirit and soul or light and dark. The Neo-Pagan practice of calling of the quarters is derived from Wiccan ritual, and through Wicca, to the Hermetic Order of the Golden Dawn practice of calling the “Watchtowers”. 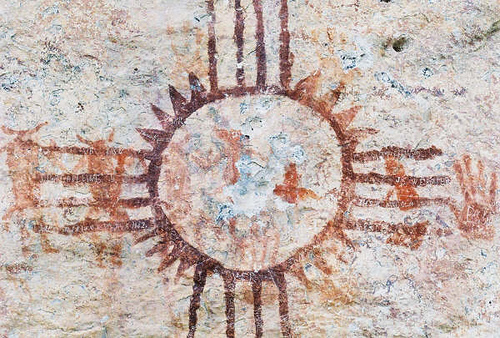 It is possible that there is a also connection to the practice of certain Native American Indian tribes, like the Hopi, of constructing “medicine wheels”, quartered circles which are drawn on the ground. Each quarter of the medicine wheel is assigned a color, an animal, a stage of life, and an element. However, according to Frederick Lamond, Gerald Gardner’s coven did not associate the directions with the four elements at first. So it is also possible that the Neo-Wiccan practice developed independently of Native American influence. The quartered circle also resembles Indian mandalas, which consist of a circle within a square or a square within a circle. The combination of circle and square is believed by some to be a transcultural symbol of the union of heaven (circle) and earth (square). Carl Jung theorized that mandalas are symbols of wholeness, specifically the wholeness of the Self.